There is no dispute that at the beginning of the nineteenth century the penitentiary system in England provided very squalid conditions. County goals, `Bridewells' and hulks formed the backbone of the British Prison System. The county goals, places of confinement for short-term offenders had their origin in a commandment of King Henry 11, who in 1166 directed that public goals be constructed in all walled towns and in royal counties. The early goals were in fact, merely places where offenders were held awaiting judgement of their cases at the next assize. Not until the reign of Edward 1 (1272-1307) were actual sentences of imprisonment imposed. In 1552 the magistrates of the City of London selected what had once been a palace at Bridewell for the detention and useful employment of vagrants and prostitutes. During the seventeenth and eighteenth centuries, Bridewell became virtually indis¬tinguishable from the county goals. All classes of convicts were imprisoned within their walls and even death sentences were carried out. The state of prisons was brought into the public domain by the efforts of such reformers as John Howard and Elizabeth Fry. The central government was reluctant to act, holding to the tenant that social provision was vested in the local Boroughs. It did invest in one penitentiary, the first from central government funds; this was Millbank in London, completed in 1821. It was described as a sprawling, shapeless labyrinth of cell blocks and ancillary buildings laying along the marshy shores of the River Thames. The convicts occupied separate cells during the first half of their sentences but were permitted to work in association with others during the second half. The coldness and dampness of the cells encouraged scurvy, cholera, and dysentery, lunacy and consumption were common. Prison maintenance became very unpopular with the English taxpayer after the seventeenth century. It was far less expensive to transport convicts to penal settlements in the underdeveloped regions of the Empire. The great shortage of servants in the North American Colonies and in the islands of the West Indies also prompted transportation as a penal device. Terms of servitude on planter's estates varied with the nature of the crime but seven and fourteen-year sentences were common. The loss of the American Colonies, however, made for significant changes in the existing transportation system: it ended the removal of criminals to North America, and it moved the reformist element in England to demand a penitentiary system which would eliminate the squalid conditions in the existing penal institutions. Elizabeth Fry had steered public consciousness as to the appalling conditions prevailing. The government was keen to develop the concept of the separate system, as exaggerated reports were being received as to its success in America. It encouraged local authorities to develop such a system, but its directions on this fell on deaf ears. As indicated in Chapter 1, the early Victorian years must be recorded as one of the great reform periods in modern British history. The Goal Act of 1823, initiated by the Home Secretary Peel, had been an impressive piece of legislation, but the local authorities found every reason and excuse to ignore it and take no action. Peel eventually gave up in despair. Further important parliamentary committees sat through the early 1830's chaired by the Duke of Richmond. Progress was slow, but was amassing evidence. Impressed still about the information coming out of America, others were sent to evaluate the system. The most important of those sent was William Crawford. He was not so impressed by the silent system, but he reported most favourably on the separate system at Eastern Penitentiary. In his report Crawford noted that the separation of prisoners subdued but did not debase them, promoted habitual sub-mission, and, with the addition of moral and religious instruction, "solitary imprisonment may be rendered powerfully instrumental not only in deterring but also in reclaiming the offender". Crawford's report had considerable influence on the Home Secretary, Lord John Russell, so much so that he persuaded the Melbourne Government (1835-1841) to approve the introduction of legislation that would expressly legalise separate confinement. This legislation received parliamentary approval on condition that the cells be so constructed as to be conducive to proper health. The erection of a model prison on this basis was decided upon by Russell and construction was begun at Pentonville in what was north London on April 10, 1840. The Melbourne government fell before construction could be completed, but Sir James Graham, Home Secretary in the succeeding Peel Ministry, not only retained the plans for a model prison but expanded the entire operation so as to include a thorough rehabilitation program as well. Pentonville is unique; it has its own Act of Parliament, The Pentonville Prison Act given Royal Assent by Queen Victoria on 18 June 1842. It was an Act it stated, `for the better ordering of Prisons.' The Act goes into some detail as to the management and operation of the model prison. It does state that `all the Lands, Assessments, and charges whatsoever.' It goes on to Tenements, and Hereditaments thereto belonging, shall state all the Lands etc. are absolutely vested in Her be wholly freed and discharged from all Taxes, Rates, Majesty and Her Heirs and Successors. These reports have survived and copies are in the Archive Section of the Prison Service Library. The Board was also authorised to remove any prison official found to be negligent or inefficient in his duties, to inspect all facilities, to contract for supplies, and to make the necessary rules and regulations for the management of the prison. The enactment also sets downs certain specific rules. No prisoner, for example, was to work more than twelve hours in any day. Corporal punishment was permitted. Prison authorities were empowered to transport convicts or transfer them to other prisons. Any convict who reached a state of lunacy was to be removed to an asylum but after a cure was effected was to be returned to Pentonville for completion of his sentence. During debate on the enactment, Sir James Graham assured members of the House of Commons that Pentonville was not to be a simple reproduction of Millbank Prison with its damp cells, high incidence of consumption, and frequent lunacy. He emphasised that prisoners were to be placed in well-lighted warm rooms and were to receive regular visits by the surgeon and chaplain. Each prisoner was to have access to the library. The prison authorities, Graham told the House of Commons, expected to introduce an education program which would prepare the inmates for a productive life after release. In guiding that bill through the House of Commons Graham had an advantage in that the prison buildings were nearly completed and the style of construction would have made them quite unfit for any other purpose without considerable expense in remodelling. The activities of prison reformers such as Jonas Hanway, Elizabeth Fry, Fowell Buxton, and others assisted Graham in gaining Parliamentary Approval. The new prison brought forth mixed reaction from the public. Elizabeth Fry was very concerned that the cells would not be properly lit and that the separate system of confinement would produce an unhealthy state of mind and body. Frederick Von Raumer, the noted German tourist and writer of the period, recorded in his diary that there was little difference between the silent and the separate systems except that the silent system was less expensive and more easily administered. The Quarterly Review condemned the negative effect that the separate system had on the mental and physical health of the prisoners. Both Blackwood's and the Illustrated London News opposed the separate system as practised at Pentonville. On January 13 1844, the Illustrated London News reported the second case of lunacy at Pentonville. On December 6 1845, it denounced the separate system at Pentonville as destructive of human individuality. Punch commented: "When a stranger first arrives at Pentonville he is struck with the difficulty in making acquaintances. There is a coldness and disinclination to hospitality". Shortly after Pentonville was opened Graham, in a letter to the Commissioners, discussed some of the fundamental purposes of the institution. He intended to use Pentonville as a place of temporary incarceration for prisoners between the ages of eighteen and thirty-five who had been sentenced to terms of transportation not in excess of fifteen years. The prisoners were to receive secular and religious instruction for a period of approximately eighteen months after which they were to be transported to Tasmania (then called Van Diemen's Land) for completion of their sentence Their conduct and progress at Pentonville determined their status in Tasmania. Similar successes were realized in the vocational education program. Many prisoners were taught trades and crafts and were later employed in their new capacities by the Pentonville authorities. The employment in 1845-46 was on average: 145 tailors, 112 shoemakers, 63 rug makers, 18 weavers, 13 tin plate workers, 12 basket-makers, 7 blacksmiths, and 1 watch maker. These statistics are informative but are not necessarily indicative of skills learned during incarceration as some prisoners had some knowledge of the trade before admission. The statistics do, nevertheless, point to a record of accomplishment not before encountered in British penal history. Even a garden class was organized to provide fresh air and exercise. The prison chaplain and his assistants were charged with the responsibility for moral and religious instruction. Each weekday a religious service one-half hour in length was held. One-third of the time was devoted to the reading and explanation of the scripture and the remaining two-thirds to hymn singing and prayer. The mortality rate for prisoners confined at Pentonville was low when compared with that of other penal institutions of the period. 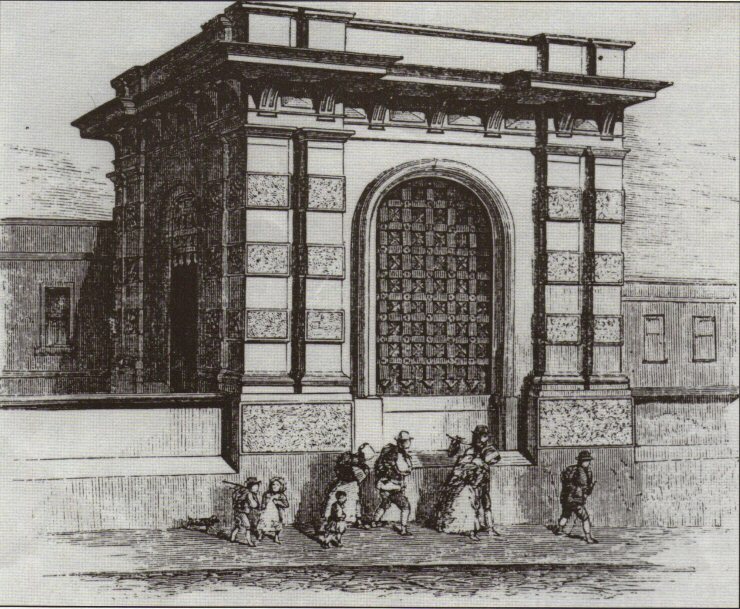 At Pentonville, for the first three and one-half years of operation, deaths averaged 7.29 prisoners per 1,000 prisoners per annum; at Millbank, during a seventeen-year period, the average was 21.89 prisoners; at Auburn, from 1821 to 1840, the average was 19.01 prisoners; and at Eastern, from 1830 to 1845, the average was 21.45 prisoners. The popular charge that the separate system as developed at Pentonville was particularly conducive to insanity was not borne out by the facts. At Eastern, from 1829 to 1839, there averaged 23.52 insanity cases per 1,000 inmates per annum, while at Pentonville the average was 3.69 insanity cases per 1,000 inmates per annum during the first two years of operation. The standard of mental and physical health at Pentonville was higher than at Millbank, Auburn, and Eastern penitentiaries. Its experimental nature, at least for the first few years, its unique construction, and the enlightened policy of secular and religious instruction contributed to this position. The commissioners of Pentonville reported on March 10, 1844, that prisoners exhibited a definite spirit of industry and that moral and religious improvement was obvious. Corruption of the young offenders by the old was virtually eliminated. Books were made available to each prisoner and he had the opportunity of participation in a vocational training program. The dull monotony of prison labour, a not unimportant feature, was broken by these innovations. 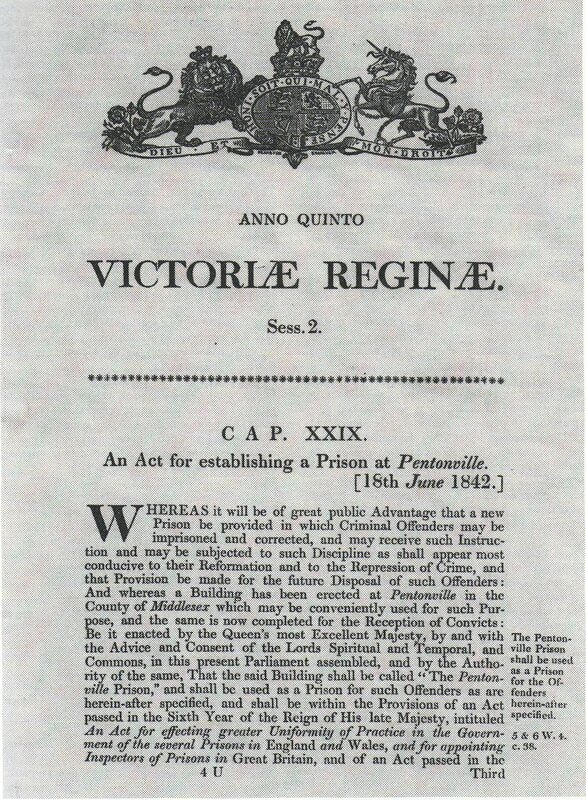 Satisfied with the progress of Pentonville, Parliament authorized the construction of new prisons or the improvement of existing facilities on the Pentonville plan. By 1848, fifty-four prisons had been built incorporating the separate system of confinement. The general treatment of prisoners has continued to improve over the past century. It is significant though, of what is now regarded as integral to the modern prison system was actually in place at Pentonville in the 1840's. The more enlightened features of the modem British penal programme had to begin somewhere, and at some time even if at a more elementary level. There is not much that exists today that does not have its origin in some measure, to the heritage of the Pentonville model prison experiment - later chapters will develop that theme in more detail.